The world’s climate has always been changing. Few people debate that premise. Rather the issue that has emerged in the international spotlight is how and why the earth’s climate is changing in this present moment? In response to this puzzle, the majority of scientists, academics, and lay people point to that environmental catastrophe propelled by man-made activity commonly known as global warming. The concept of global warming is a simple one to grasp. The earth is steadily warming from heat-trapping gasses (such as methane and carbon dioxide) in the atmosphere. These gases are increasing faster than the earth can naturally absorb, resulting in increasing average temperatures on Earth. The consequences of climate change have more dire effects than the average man donning woolier garments during the winter months and shedding extra layers over the summer. The warming planet means hotter oceans, melting ice caps, and more extreme weather, all of which have ranging effects from obliterating entire species to causing drastic changes in our food supplies. Under the impending threat of global climate change and its discontents, our planet is in peril (though the dangers may be difficult for the naked eye to detect from one day to the next). What can be ascertained is how different countries of the world react to global warming. The ranging levels of acceptance and denial are alarmingly widespread. According to a June 2013 Pew Research Center poll, the majority of residents in Brazil and Argentina, 76 percent and 71 percent, respectively, agreed that “global climate change is a major threat.” In contrast, only 40 percent of Americans in the same poll believed that climate change is an important issue. In fact, of the 13 countries examined in the Pew Research Center poll, the 4 English speaking-countries (United States, Britain, Australia, and Canada) were ranked near the bottom of the list. Of those, the United States and Britain were the least concerned about global warming. Unfortunately, this poll is not an isolated result. In a more recent 2014 Gallup survey, only one third of Americans said they worried a great deal about global warming. However dormant the issue lies in the Western subconscious, the effects of global warming impact residents in Western territories on a daily basis. Farms in California in the western part of the U.S. have experienced intense droughts. All over the coast of Florida in the southeastern U.S., cities have suffered floods, which are becoming increasingly common due to rising sea levels, high tides, and heavy rain. Even a recent Florida Department of Technology study predicts that over the next 35 years, smaller local roads in the Miami, Florida area will increasingly flood and experience severe damage due to rising sea levels. Despite these weather conditions, President Obama appears to be on the fence regarding the issue. Although Obama has publicly stated that immediate action is necessary to combat rapid global climate change, bills aimed at alleviating the problem, such as taxing carbon pollution, have repeatedly failed in the U.S. Congress. Why then, in spite of the overwhelming evidence about global warming, are Western nations far less concerned about global warming compared to the rest of the world’s global citizens? In searching for a solution to Western apathy towards global climate change, some cite cultural deficiencies, questioning the extent to which Western cultural traditions look forward or backward, with respect to their own successors and descendants. Others around the world may care more deeply about their inter-generational legacies, subsequently taking actions that will preserve the environment for their grandchildren’s children and their posterity. Self-proclaimed developed countries have accelerated the trail of climate disaster, building their economies and benefiting their rich in utter disregard for the environment and nature. Although money and wealth undoubtedly do not trickle from the top down, a low level of awareness, acknowledgment, and concern about global warming rather does. This misinformation funnels through an inward-looking, insular, and narcissistic Western media that privileges English-speaking sources and ignores vocabulary requiring translation or subtitles. Lacking a genuine world news perspective in favor of biased insight into how the world works, Western news media unilaterally sways public opinion on issues like global warming. Special interest groups bombard the public consciousness with propaganda, reducing the issue to a highly politicized battle between Republicans and Democrats, as a way to demonize the opposing side. Environmentalists are castigated and ridiculed as tree-hugging hippies. Conservative pundits–some with political aspirations fueled by big oil industries–promote repetitive campaigns of scientific disinformation. For Americans, issues on healthcare, the economy, employment, and even Islamic extremism have garnered more attention than global climate change, though ironically, climate change impacts all of these issues. The threat that follows from ignoring environmental concerns is great and can lead to–at its furthest extremity–a mass human extinction, that is, if collectively the world’s citizens do not make efforts to drastically slow, or even reverse, the earth’s warming climate. When the desires of a few wealthy individuals are placed on higher pedestals than the needs of the global society, all will inevitably suffer. Several changes need to happen in order for the global climate to alter its course in a more positive direction for the world’s citizens. With increasing fossil fuel emissions warming the planet, national and international policies to cut carbon pollution are an obligatory step in the process to prevent global warming’s dangerous effects. This would require extensive regulation and/or taxation on the oil, gas, and coal industries, and especially targeting the world’s top emitters: China and the United States. Unlike these nations, African nations in sub-Saharan regions contribute relatively little to global warming. The world’s countries must also devote serious effort into investment in renewable energy, including wind energy farms and research and development of technology that could potentially harness greater amounts of the vast well of virtually untapped solar power. These and other large-scale investments into a green economy will have great economic benefits for countries, in addition to their paramount contribution to a more inhabitable planet. This is the root of the problem in the West. This is their hypocrisy. This is what makes them ‘devils’ ready and willing to destroy a planet our ancestors have kept for hundreds of thousands of years. Maybe the USA and Britain, and now China should stop pouring CO2 and Methane into the atmosphere like they pour McDonalds Burgers into their fat bellies. Then, maybe, just maybe, the Earth can can be saved. Because people think the Adam Smith’s Jewish way of thinking about Economy is the right way, the world would never be the same again. Because the USA always prides around in the name of Capitalism, this is what you get. Obviously, Adam Smith’s Economy and Capitalism did not factor in the Environment on which these heinous practices depend. That is the fundamental flaw of Adam Smith’s notorious illiterate Theories and of the West’s Capitalism. They are on the brink of killing us all. This people we call the West – they are something O. This people we call white people – they are something O. Twice they have come close to destroying humanity and all living things with Atomic and Nuclear Bombs. This time, they have devised the most efficient way – kill us all slowly! These people need to be saved from themselves or they will kill us both. Africa’s new job in the 21st century perhaps is to save these people from themselves and from us. But alas, they are so childish, so cantankerous that it must take a severe lashing on the buttocks before they will listen. 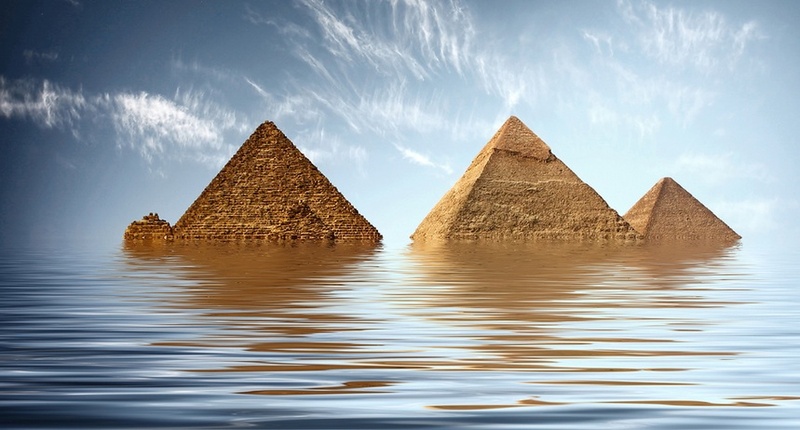 Well, so long as our Pyramids stand. Hopefully, after we’ve all been killed by the West’s insatiable appetite for material possessions, some life form will rise and see the Pyramids and know that there were once upon a time, intelligent, tolerant and caring beings – Africans. It’s still will be a shame! The issue has nothing to do with the West. They created all these nice technology which we love to use around the world as well. The issue has to do with all of us, don’t pretend Africans don’t sell petroleum, don’t pretend that we don’t pollute just as much. But I think the ball is still in the court for the US and the EU to begin to retract their world view on Economics and life. Up until now, they haven’t still come up with a religion to keep the earth sacred… that I feel is the beginning of the destruction of the planet we have lived on for millions of years.